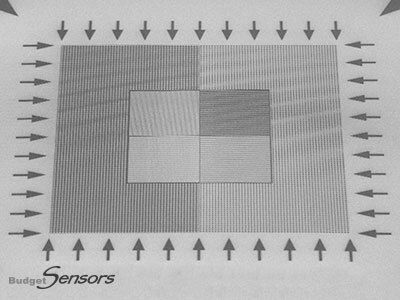 HS-20MG is one of the height standards introduced by BudgetSensors as a response to the increased demand for affordable high-quality AFM calibration standards. The HS-20MG features silicon dioxide structure arrays on a 5x5mm silicon chip. The fabrication process guarantees excellent uniformity of the structures across the chip. This in turn ensures easy and reliable Z-axis calibration of your AFM system. The calibration area is situated in the center of the chip. It is easy to find with the AFM optical system. The structure step height is in the range of 20nm. The exact value for each chip is indicated on the box label. The HS-20MG chip is glued onto a 12mm metal disc using a high-quality electrically-conductive epoxy resin and it is ready for use as shipped. It is also available unmounted (HS-20MG-UM).